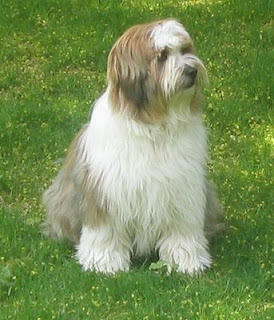 Tibetan Terrier originated in Tibet just like other Tibetan breeds. Just like Tibetan Spaniels, even these were considered to be holy dog of God and could not be sold. It was only given as gifts to the Royal family and important personalities as a symbol of peace. It is a medium sized breed with their coat covering their eyes due to which resemble them a sheep. This breed is nice, sweet and gentle. They can be used as a watchdog and a guardian. This breed of dog is intelligent, brave and bold. They seek attention and tend to become destructive if left alone for extended period of time. Early age socialization is important. They are good with other pets and small animals that they are brought up with. This breed of dog is alert and suspicious of strangers and warns their owners of danger. This breed of dog has double coat with the outer coat being long, straight and fine in texture where as the under coat is dense, soft and short. The colors include white, cream, silver, gold, black, and red. This breed sheds little to no hair. This breed of dogs is good learner and learns quickly. They are independent in nature. They will not respond to hard and harsh methods of training, the method of training adopted should be fair, firm and patient. This breed of dog requires regular exercise to keep fit. They love to go for a walk and enjoy the family play sessions. They are good in apartments if they are provided sufficient exercise. This breed of dog need lots of grooming and should be brushed regularly to prevent dirt and dead hair. However, the bathing should be done with dry hair only when mandatory.